gradient leaving Bere Alston Station for Calstock, circa 1962. 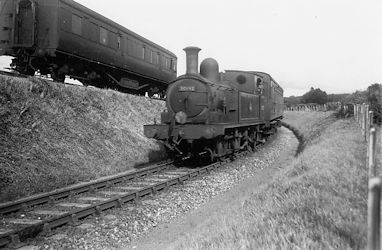 The reader will no doubt ask why the Bere Alston to Callington Branch railway is included in Railways in Old Devonport. The first reason is the junction station, Bere Alston, was on the Southern Railway main line that ran mostly through Old Devonport; and the second reason is that the Tamar Valley, especially around Calstock Station, supplied Devonport Market with much of its inexpensive produce via either the railway or the Devonport Market Boat on the river Tamar. A third, though tenuous reason, is that many workers in the Royal Dockyard chose to move to the Calstock and Gunnislake area during the dark days of the Second World War and the line had through coaches to and from Friary Station in Old Plymouth for those workers, who used to travel to and from Camel's Head Halt and Ford Station. Way back in 1862 the Tamar, Kit Hill and Callington Railway Company were authorised by Act of Parliament, to construct a railway from the mines around Callington, in East Cornwall, to the quay at Calstock, on the river Tamar, where their products could be transferred to boats to be shipped all over the world. Although work started on the line in 1863, it came to a grinding halt three years later because of a financial recession. In 1869 the project was revived by a new enterprise, the Callington and Calstock Railway Company. They changed their name to the East Cornwall Mineral Railway Company, who acquired the legal powers to complete the construction of the line to a gauge of 3 feet 6 inches and declare it officially open on May 7th 1872. There were no passenger stations only mineral depots and private sidings to mines and quarries. Following the opening by the Plymouth, Devonport and South Western Junction Railway Company of their new main line between Lydford Station and Devonport Station in 1890, they purchased the East Cornwall Mineral Railway Company the following year with a view to extending it to link up with their main line. They obtained the Bere Alston and Calstock Light Railway Act and in 1908 opened the extension from Calstock Station over the Calstock Viaduct and up a steep incline to Bere Alston Station. In addition they changed track to standard-gauge (4 feet 8½ inches) and upgraded it to enable passenger trains to be run. A number of Stations were opened, mostly at or near the sites of the mineral depots, and even Halts appeared. Although the main line was taken over by the London and South Western Railway Company, the branch line was retained by the Plymouth, Devonport and South Western Junction Railway Company and worked by their own locomotives and rolling stock until it was absorbed into the Southern Railway Company at the Grouping of 1923. On January 1st 1948 it was, of course, nationalized and became part of British Railways Southern Region. Between Bere Alston and Calstock 260 tons for both locomotives; Between Calstock and Callington 100 tons for the O.2 and 120 tons for the 2MT; between Callington and Calstock 260 tons for both types; and between Calstock and Bere Alston, 100 tons for the O.2 and 120 tons for the 2MT. The Regulations in October 1960 stated: The gradients throughout this branch are severe and hand brakes in the minimum proportion of one to every two loaded or three empty wagons must be applied on all freight and mixed trains before descending any decline. In adverse weather additional brakes must be applied as the conditions necessitate. Guards must ascertain from drivers the number of brakes to be applied to enable trains to be effectively controlled. Fully fitted wagons must be marshalled at the front of the train as far as possible and the hose pipes connected, the number of wagons so connected to be included in the brake power referred to previously'. An attempt to modernise the line by the introduction of diesel multiple units in 1964 was nearly an unmitigated disaster. The Callington Branch was destined for complete closure but because of the difficulty of road access to the area around Calstock only the section from Gunnislake Station to Callington Station was closed to traffic on and as from November 5th 1966. The remaining section was amalgamated with the remnant of the old Southern main line through Old Devonport to create the modern Gunnislake Branch. in the dark if the last Branch train had left Bere Alston before the train from Ford Station had arrived. The Viaduct was guarded by the Home Guard and so he always challenged.